A Power of Attorney usually terminates when the Principal is no longer to make decisions on his own or is incapacitated due to any reason, but a “Durable” power of attorney remains effective even if the principal is incapacitated. A Durable Power of Attorney must specifically have the words mentioned in the document stating that the powers granted remain intact even if the Principal is not capable of making his own decisions. When Should I use a Durable Power of Attorney Form? when your not available to sign an important document and you want someone else to sign it for you. Can a Durable POA revoked and when does the powers come to an end? 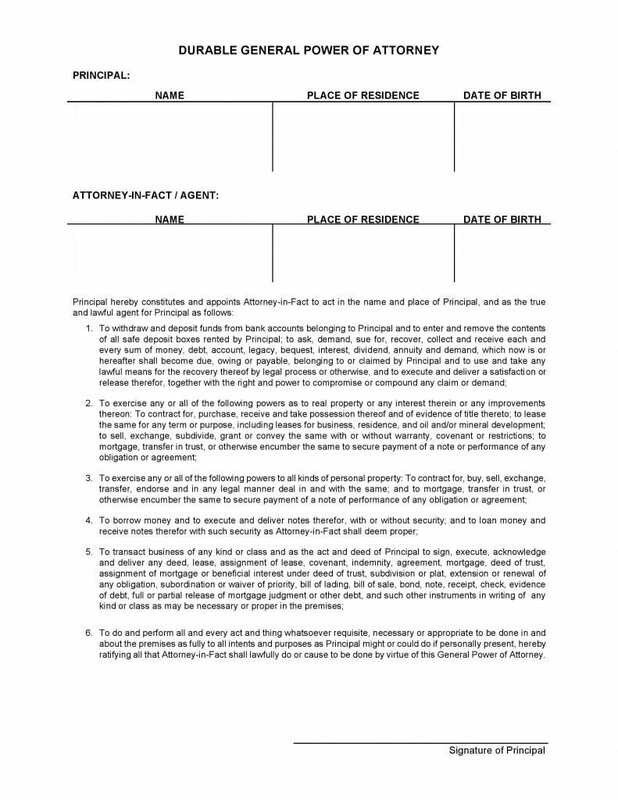 This is a Blank or Common Durable POA Form which can be used in all States, provided your state does not require you to have a specific durable power of attorney form which you may download from the table above. In General a Durable Power of Attorney form gives your attorney-in-fact authority to make decisions related to financial matters, real estate matters and personal property matters. It is advisable for you to have a trustworthy “agent” or “attorney-in-fact”. Once you download the form, Enter the Details of the Principal such as the name, address and the date of birth. Enter the details of the “attorney-in-fact” / “agent”. Read all the powers the principal will be granting the appointed agent and then the principal will be required to sign in the specified area. This has to be done in front of a Notary Public and a witness, the principal has to first acknowledge that the POA will remain active even if he is incapacitated or his disability to make his own decisions. Then write his name and the date along with his signature. The witness then has to write his / her name, the date ,after which the witness has to sign the form once he/she acknowledges that the principal has signed this form on his own will and not under any influence. The Notary Public in your state signs and seals the form and it becomes legal.